December 13, 2018 10:30 pm. Al Ain staged their final meeting of 2018 on Thursday, highlighted by a 2000m Purebred Arabian handicap which was won in determined fashion by Inthar, something of a surprise winner, driven clear by Bernardo Pinheiro for Khalifa Al Neyadi who both owns and trains the winner. An 8-year-old entire and thus oldest of the seven runners, Inthar tracked Ashraaf until that rival dropped away quickly with 600m still to run at which point Pinheiro boldly went for home in what, ultimately, probably proved the move that sealed the race. Mukaram tried to throw down a challenge under Pat Cosgrave over the final 400m, but they were never getting to Pinheiro’s mount who was winning for the third time on his 26th outing. His previous was also at Al Ain, in a 1400m handicap in January, having lost his maiden tag over 1200m at Sharjah in October 2016. Pinheiro explained: “I know this horse well and have ridden him in each of his last five starts, all over shorter trips, but we decided to try a longer distance today and it has suited him. The only Thoroughbred race, also a 2000m handicap, looked wide open on paper, but in reality was turned into a procession by Mears, saddled by Ali Rashid Al Rayhi for Jumas Mubarak Al Junaibi. Drawn wide, the 4-year-old gelded son of Street Cry was settled on the outside in about fourth by Fernando Jara. Stable companion and the same owner’s Cross Step led until about the 600m marker and it was soon after Mears hit the front before scooting clear with 450m still to run and the result never looking in any doubt afterwards. 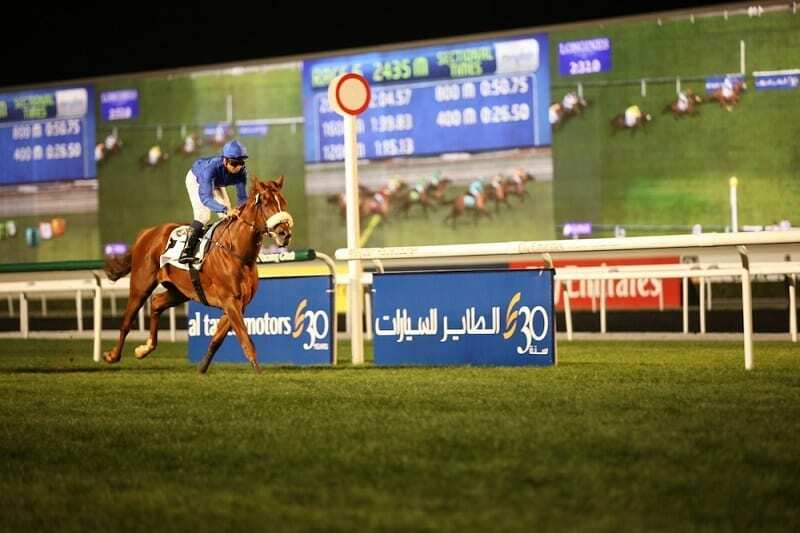 It was a second career win for Mears, victorious in a 1900m handicap on the dirt surface at Meydan in January and he was making his second Al Ain visit a successful one having chased home Parklife, third on this occasion, over 1800m just over a year ago. The meeting opened with a handicap over 1800m, won in determined fashion by RB Fired Up, trained locally by Helal Al Alawi for Abu Dhabi Racing and confidently ridden by Billy Lee. After a tardy start, Lee was happy to take his time, settling the 5-year-old towards the rear of the 11 runners before easing him closer on the sweeping home turn. Asked for his effort early in the straight, Lee’s mount responded well, passing long time leader AF Al Baher, who plugged on gamely for third, at the 350m pole. They were immediately challenged by ES Maydan, trained on the Al Ain track by Mohamed Ramadan and who looked the more likely winner with 200m left under apprentice Rowan Scott. However, they were never quite able to wrestle the initiative from RB Fired Up who was registering a third career victory and second over course and distance having won a similar handicap last November. That was actually his second UAE outing, having arrived from the US with a 1600m debut victory at Delaware Park to his name. Having delayed the start of the 1800m maiden to allow for some tack adjustments behind the starting stalls, Sadeq Al Waad proved he was worth waiting for with a smooth victory under Royston Ffrench. A second ever winner for owner Mohd Hassan Saleh, it was a first runner this season and since February 2017 for trainer Hassan Al Hammadi whose 5-year-old dirt debutant was shedding his maiden tag at the fourth attempt and third this season. Always seemingly going best of all, settled just off the lead, Ffrench’s mount was left in front when early leader Maysson dropped away quickly just after halfway and it was apparent early in the straight they were not going to be caught. An hour later, the jockey was back in the winner’s enclosure having posted an equally comfortable success aboard JAP Yajoud in the 1400m handicap, the pair following up a last gasp course success over 1000m three weeks ago. Sporting the famous green silks of Sheikh Saeed bin Maktoum Al Maktoum and riding for Irfan Ellahi, Ffrench clearly wanted to wait as long as possible before committing for home, but seemingly had little to worry about throughout.Winner of a 1700m Sharjah maiden on just his second start in January, the homebred 4-year-old has now won three of his eight career starts, as well as twice finishing second, over a wide range of trips and is clearly versatile. The 1600m maiden proved a memorable one for trainer Abdallah Al Hammadi who saddled both first and second for his main patron, Al Ajban Stables. It was Connor Beasley and Maaly Al Reef who landed the spoils, chased home by Sallal Al Reef who was closing throughout the final 300m for Gerald Avranche, but never looked likely to bridge the gap. Having his eighth start, sixth on dirt and third this season, 4-year-old Maaly Al Reef was able to overcome a slow start to cruise into contention on the home turn before sent to the front in what proved a decisive mood. Satish Seemar no longer has many Purebred Arabians among his string at Zabeel Stables, but with one of the few he does have struck in the concluding 1000m maiden with Elsa Du Bibal. Ridden by Richard Mullen for Imhamed Nagem, the 4-year-old filly was opening her account on her seventh start and third at Al Ain. She and Mullen were second in a maiden over the same course and distance last Friday, behind easy winner JAP Muwaki and led close home on this occasion to deny Aseyl.